On Friday, my most awesome co-worker Jess invited us to a secret meeting at 3 p.m. The meeting was to play HQ Trivia. 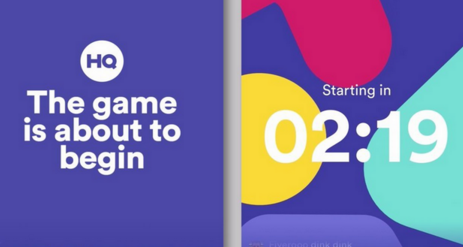 HQ Trivia is a live trivia game that broadcasts each night at 9 p.m. and on weekdays at 3 p.m. You play along on your phone and the prize money is split between all the winners. The prize tonight, Sunday, February 18this an epic $25,000, their biggest prize ever. I played twice on Friday and was hooked immediately. There were six of us playing at 3…along with 668,000 other people. You read that right. Six hundred and sixty-eight thousand people! At 9 p.m., there was Clare and I….and just under a million other people playing. Both times, we killed it on the first three or four questions, but here’s the skinny—they make the first questions really easy to hook you in. After each round, the questions get harder and harder. Just when you think you’ve got this, the host lays it on you–the Savage Question–the question that knocks out hundreds of thousands of people. Not only is HQ Trivia fun and addictive, it’s a social and technological marvel. It boggled my mind to think I was online with hundreds of thousands of other people at the same time doing the same thing and watching the elimination numbers each round: from 998,000, to 924,000 to 762,000 to 682,000 then down to 324,000 (after the Savage Question) until the final round when only a handful of players claim victory to split the $2,500 jackpot. This week’s #HappyAct is to download the HQ Trivia app and play along tonight. And whatever you do, don’t call our house at 9 p.m. We won’t answer the phone.